3rd deposit: 5 Spins with the code PANDA3. 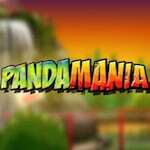 Use the extra rounds only on Pandamania slot machine. Wager the bonus amount 50 times before making any withdrawals. This offer will surely make you fall in love with this online casino!